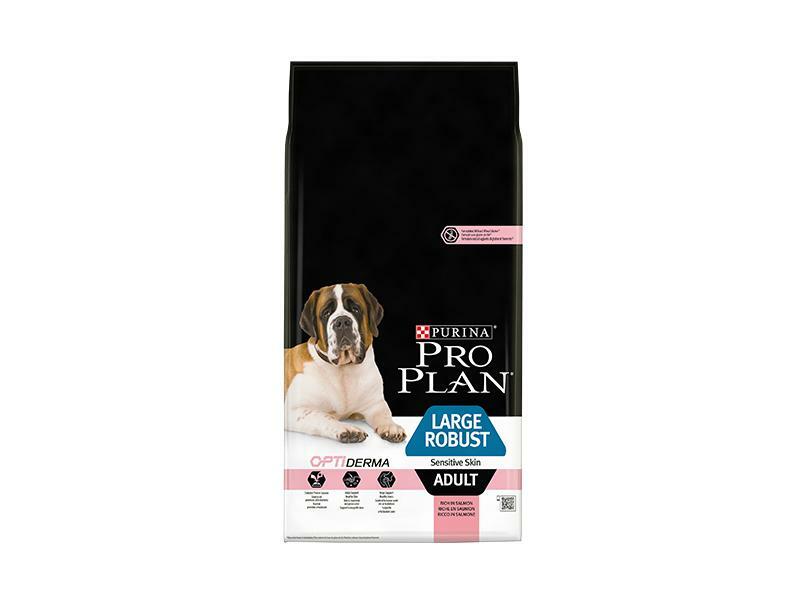 PURINA® PRO PLAN® DOG Large Adult Robust Sensitive Skin with OPTIDERMA® has been created by PURNA® expert vets and nutritionists to provide large-sized adult dogs with complete and balanced nutrition that also targets their sensitive skin. OPTIDERMA® is a carefully chosen balance of essential nutrients that are proven to target skin and help support a healthy coat. Our recipe contains sources of protein which help reduce possible skin discomfort associated with food sensitivty. As well as being made with high quality salmon, our recipe helps support your large breed dog's healthy joints for their active lifestyle. This complete and balanced dog food is made with high quality ingredients, including salmon, for a delicious and complete meal for your dog to enjoy every day. Salmon* (16%), Rice* (14%), Maize*, Dehydrated salmon protein*, Maize gluten meal*, Maize grits*, Soya meal*, Dried beet pulp*, Digest, Animal fat, Minerals, Cellulose, Dried egg*, Soybean oil, Fish oil. Feeding Guide: See table for recommended daily feeding amounts. These amounts are guidelines only. To help keep your dog in an ideal body condition, adjust according to your dog’s activity level, physical condition and individual needs. Clean, fresh water should be available at all times. To monitor your dog’s health, consult a veterinary surgeon regularly. There are currently no questions for Purina Pro Plan Dog Large Adult Robust Sensitive Skin with OPTIDERMA® - be the first to ask one!